This was, without doubt a very enjoyable book to read, even though it wasn’t much of a science book. If you want to find more about bees themselves, read The Buzz About Bees, which I think is unbeaten as an exploration of the nature of bees. Here you won’t really even get a feel for what a superorganism is, or how individual bees really aren’t animals in their own right. However what you will find a lot about is beekeepers and their complication-ridden business. I was amazed at the complexity of industrial scale beekeeping in the US – how, for example, the bee people are paid large sums by almond growers to transport their hives into the almond groves to perform the pollination, then have to move out again swiftly as there is no food at all for the bees once the blossoms have gone. This whole idea of driving thousands of hives across America is one I simply hadn’t realized existed. 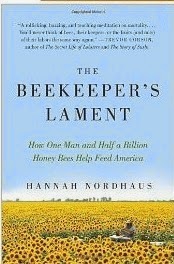 Similarly it was fascinating to read about all the difficulties industrial beekeepers have faced. Like most people I was vaguely aware of the ‘disappearing bees’ when Colony Collapse Disorder struck, but not just how delicate bees were and how afflicted by other disasters, particular a nasty mite that destroys them wholesale. Equally, along with that vague awareness I thought bees were in danger of disappearing – and they would if left to their own devices – but so effective is the industrial process that bee numbers are being kept up by setting up new colonies with remarkable rapidity. This is, without doubt a very readable book, though I do find Hannah Nordhaus’s writing style a little self-consciously arty. There are bits of science that you’ll find out along the way, but it’s much more about the industry and its ups and downs, something that’s fascinating in its own right. Recommended.